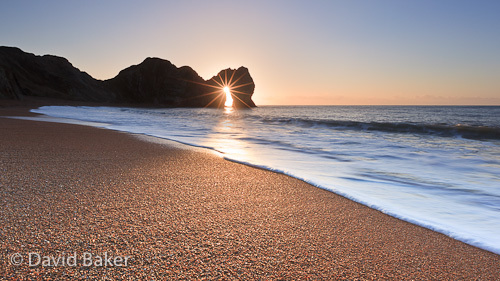 I’ve been waiting for the opportunity to shoot Durdle Door with the sun rising through the arch for a while and with only a small window of opportunity due to the movement of the sun I was in position this morning. It didn’t look like it was going to happen due to a bank of cloud on the horizon, however as the sun rose above the cloud there was just enough time to shoot as it reached the top of the arch. ~ by David Baker on 9 January, 2011.